What could be more embarrassing and socially unappealing to those around you than a bad breath? While it is not a medical emergency, over 20 percent of people have one type of mouth odour. 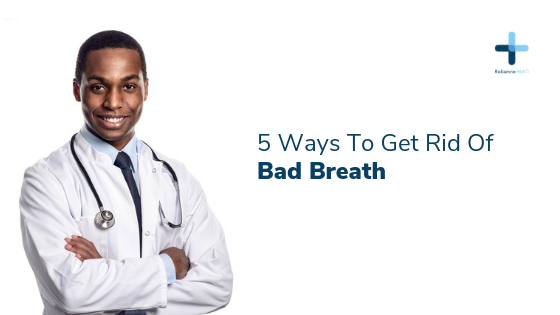 A good oral hygiene and a change in certain habits can help you combat bad breath. 1) Floss more often – After brushing most times food remains stuck between your teeth, when bacteria breaks down these food particles, it leads to bad breath. When you make a habit of flossing, you remove food particles that can cause bad breath. 2) Brush regularly – Plaque builds up around the enamel of each tooth when bacteria acts on carbohydrates. Brushing your teeth twice a day will help you shed the plaque buildup and remove food particles that lead to bad breath. 3) Rinse after eating – Always rinse your mouth properly, after eating anything especially sugary food. A quick rinse after each meal goes a long way in maintaining a fresh breath. 4) Drink Water Regularly – A dry mouth is convenient for bacteria activity. Drinking water regularly to keeps your mouth hydrated; it ensures you produce enough saliva and reduces the odds of developing bad breath. 5) Scrape your tongue – The coating that gradually forms on your tongue can be a host for bacteria activity. After brushing your teeth, gently brush your tongue with your toothbrush to get rid of the coating on your tongue.